Questions have been raised about the quality of school teachers in India. The National Council of Teachers Education (NCTE) which regulates the Teacher Education Institutions (TEI) has long been blamed for poor quality as there are B.Ed colleges which barely meet the standards required to produce quality teachers. Functioning under the nose of the authorities, most of them are still unaccredited. There are also fly-by-night TEI which virtually sell B.Ed degrees to students who do not attend any classes. HRD Minister Prakash Javadekar has said a crackdown has begun against these fly-by-night institutions. 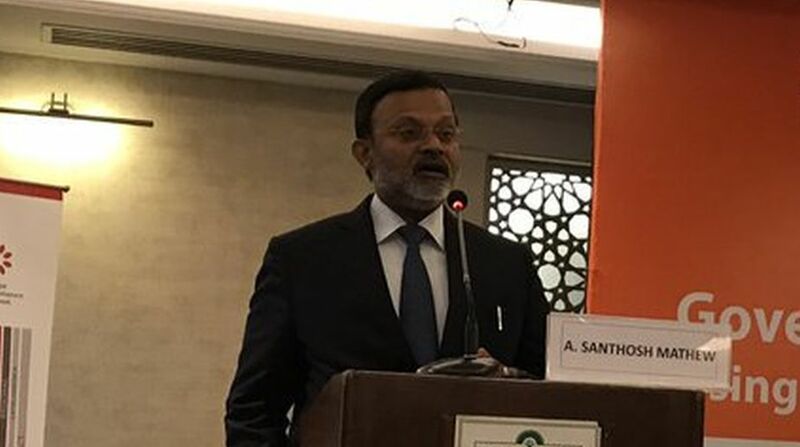 A Santhosh Mathew, the chairman of NCTE, is a political economist with extensive experience as a civil servant in the Indian Administrative Service. With a D.Phil in Development Studies from IDS, Sussex, and an MA in Economics from the Delhi School of Economics, he combines teaching and research with his assignments in the civil service. Previously, he served as Joint Secretary (IT & Skills) in the Ministry of Rural Development, Government of India. In an interview with ABHIJEET ANAND, Mathew revealed the process through which there will be a clampdown on TEI. He also spoke about how the teaching sector can be given a stimulus. Q: It has been decided that no new B.Ed colleges will be opened for a year. What has prompted such a drastic decision? A: It is just that we will not invite any applications. On the one hand in most parts of the country we have a surplus of colleges and on the other, a need was felt to redo the entire application process. There was arbitrariness in the way applications were processed that was leading to allegations of corruption. We took a decision to redo and digitise the process. As you upload your application you will know whether data points you need have been entered. You will not know who is taking a decision as it will be anonymous. The reason for which the application is accepted or rejected will be made public. There is lot of IT work, a lot of design. That is why we declared it a zero year. Q: HRD Minister Prakash Javadekar has talked about flyby-night B.Ed colleges. What is NCTE doing about them? A: One of the big decisions we took was announcing India’s first accreditation and ranking framework for Teacher Education Institutions. We have changed the regulations by which you are required to get yourself accredited within 12 months of notification. By April 2018 all colleges that do not have a valid NAAC accreditation will have to get themselves accredited. Accreditation also means that we have four different pillars on which they are marked – physical assets, academic assets, teaching quality and learning outcomes. Earlier much of the emphasis was on regulatory compliance. Now we have gone much beyond. All this together will ensure that it will be extremely difficult for fly-by-night operators to operate. Q: Are you saying that the earlier process of accreditation was not good enough? A: What I am saying is… we did not have a sector-specific accreditation. Our accreditation was a general NAAC accreditation process. NAAC takes the entire university and accredits it. In the teacher education sector, there are specific requirements. That is why we designed one ourselves. Q: But as part of the process, affidavits are also being sought from the colleges. A: All colleges were asked to submit mandatory affidavits. They were asked to put in certain data. Many people did not do it. Subsequently, we asked those who did not submit it to respond to a show-cause notice. The total number of show-causes plus affidavits came to only 11,474 colleges out of 16,000 to 18,000. In the affidavits that were submitted a lot of columns were left blank. We redesigned the mandatory affidavit system and we said that unless all data fields have been entered, your submission will not be complete. The computer can check whether all the fields have been entered or not. We have extended the date of submission of affidavits from 31 July to 31 August. Mandatory affidavit system is done in such a way that all data we need for accreditation has been covered. We will do a verification of that. Then we will put these together and do the accreditation. Q: Can you tell us about the initiative taken for ranking of B.Ed colleges? A: Ranking and accreditation are analogous but not identical. Ranking is a once in two-year process. And accreditation is once in five years. As I said, accreditation requirement comes only after your existing NAAC accreditation expires. NAAC accreditation is for five years. If you have NAAC accreditation, we don’t expect you to get accredited with us. The moment it expires, you have to come and get it. We will do scoring on the basis of that assuming that what they have said is correct. The top 400 institutions through that scoring mechanism will be inspected once in two years and the verified score will be generated. The top 200 colleges will then be published and ranked. There is a particular logic behind this – we will be able to signal to the market which are the top colleges. If we can signal this, we believe that the fly-by-night operators will go bust because students will not go to them. Q: A four-year integrated course will soon be made mandatory for pursuing B.Ed. Is this being done to make the course more professional? A: It is not a question of making it more professional or less professional. The qualification for pursuing diploma course is actually passing school. If you pass DElEd you become eligible to teach in primary classes. We are of the opinion that a degree should be the basic qualification of a teacher. A person who has passed only +2 school should not be eligible to become a teacher. This is a policy decision that the council will take in due course. We are seriously considering doing away with all diplomas. In the degree courses also, we are saying that the law course BA,LLB should be in the form of 3+2. With the coming of integrated law course and national law schools, the sector really got a fillip. We want to try the same thing. There will be BA BEd, BSc BEd and B.Com BEd. In that we will allow people to specialise in pre-school, primary and secondary. We will also indicate the medium in which a person is trained and allowed to teach. This will be like one degree and multiple pathways like MBA in finance or HR. We want to introduce new specialisations like testing and assessment which is extremely important in education science. The new thing we want to introduce is BA B.Ed in special education. There are a lot of people from tribal regions coming from a particular way of life. Teaching tribals requires a great deal of expertise. We are thinking of specialisation in tribal pedagogy. Lastly, we want to introduce specialisation in Ed.Tech or education technology.